1.Preheat oven to 350°. Spray rimmed baking pan with cooking spray. In small bowl, combine Parmesan cheese and Italian seasoning. 2.Gently unroll pizza crust dough onto prepared pan; stretch dough into 10 x 14-inch rectangle. Leaving 1/2-inch border, evenly layer salami and pepperoni over dough; sprinkle with pizza cheese and oregano. Starting from long end, roll up dough and fillings; place roll, seam side down, on prepared pan. Gently rub Parmesan cheese mixture over outside of roll. Bake roll 25 to 30 minutes or until golden brown. 3.Meanwhile, in microwave-safe small bowl, heat pizza sauce, covered, in microwave oven on high 1 to 1-1/2 minutes or until heated through. 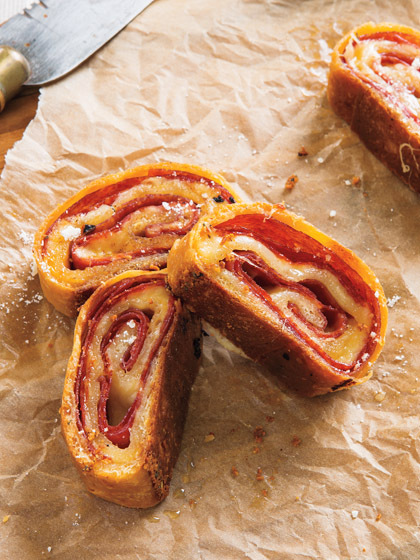 Slice roll into 1-inch pieces and serve with pizza sauce.